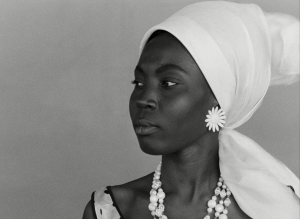 La noire de…, created by the Senegalese intellectual, author, and film maker Ousmane Sembène, is considered the „first“ film in which the former colony is not made a subject of discussion by „the West“ but the other way round – it is now the previously colonised country which visually reflects upon its point of view in a self-determined way. 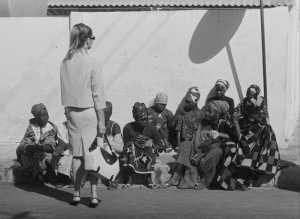 As a consequence, this film classic shot in black-and-white in 1966 does not feature folkloristic stereotypes but openly depicts the modern postcolonial oppression oft the „Blacks“ in Europe by taking the example of Douanna, a nanny who works for a French family. 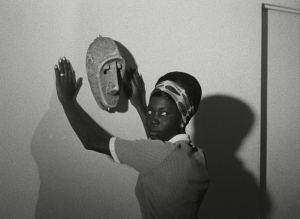 Ousmane Sembène (1923-2007) Born in Senegal as son of a fisherman. He began working as a craftsman and dockworker in several French cities and advocated for the workers’ rights throughout his whole life. After having published various novels, around the age of 40 he started studying Cinema in Moscow in order to reach a bigger audience for the topics that he deemed sensitive, especially regarding the criticism of colonialism. 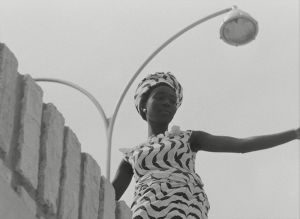 For many, he has been viewed as the “forefather“ of the African film.